Nanobes are tiny filaments found in sandstone 3 kilometers below the seabed off Western Australia and claimed by a team of geologists at the University of Queensland, Brisbane, to be the smallest known living organisms.1 With diameters of between 20 and 150 nanometers (nm), the nanobes fall below the size range of the smallest known bacteria, Mycoplasma, which lack cell walls and have a diameter of 150 to 200 nanometers. If the claim is verified it would lend credence to the controversial 1996 announcement by NASA scientists of "nanofossils" in a Martian meteorite, some of which were just 20 nm across. The Queensland researchers said that the nanobes grew in the laboratory when exposed to air, moved away from the electron beam during scanning electron microscopy, and possess structures like cells walls. In addition, three different DNA analyses of them gave positive results. However, the claim remains controversial with other experts warning that the DNA could be from contamination on the rock surface and pointing to the unusual fact that the filaments should grow in air when their normal environment is anaerobic. 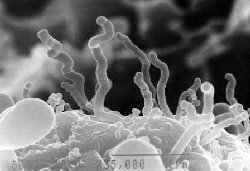 If the nanobes are confirmed as alive, they will break not just the small size record but also the record for hyperthermophiles since at the depth they were found the temperature is more than 150°C. 1. Unwins, P. J. R., Webb, R. I., and Taylor, A. P. "Novel Nano-organisms from Australian Sandstones," American Mineralogist, 83, 1541 (1999).